Curtis told me he wasn't going to listen to General Conference. True to his word, he played the iPad for pretty much the whole session. But that doesn't mean he wasn't listening. As conference ended, the organist played a postlude of Families Can be Together Forever. Without looking up from his game, Curtis said, "I don't even know this song. Every time we sing it in Primary, I don't listen. And I just mouth the words." In sacrament meeting the next week, all the kids were asked to come up and sing that very song. Paige marched up to the front. Curtis, as usual, refused to participate and instead hid under our pew. Tate, now a Sunbeam, had his first chance to sing with the Primary choir--but he was asleep on my lap. We're not great at church. Today was the first day of Spring soccer. Tate was so excited about his new uniform that he hadn't taken it off since he first got it on Tuesday (he's even been sleeping in it). Given my gimpy hip, I decided not to coach his team this season. It was nice to be able to just relax and watch Tate play. I've never seen a kid who spends more time smiling while he runs around. He had a hard time following the ball because he was too busy grinning--not at us, just at life in general. Tate also spends a lot of time falling down (he's learned from his older brother that ending every run with a dive or dramatic roll makes soccer way more fun). 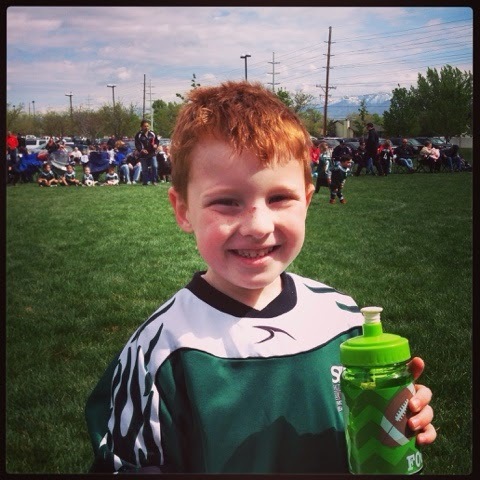 He did manage to score a goal--it was during a timeout, but he didn't know that and there was need to tell him otherwise--and that made him even happier. After all of that running and smiling, he went to bed exhausted--wearing his uniform, of course. What's the Opposite of a Selfie? It's nice to have a kid who is now old enough to take pictures. Paige snapped this shot of us--on her fourth try. The first had her finger in it. The second and third were blurry. But with her last attempt, she got this gem: A picture of a husband and wife who are happy, despite being generally exhausted all the time. The face of a boy who is six for just one more day. 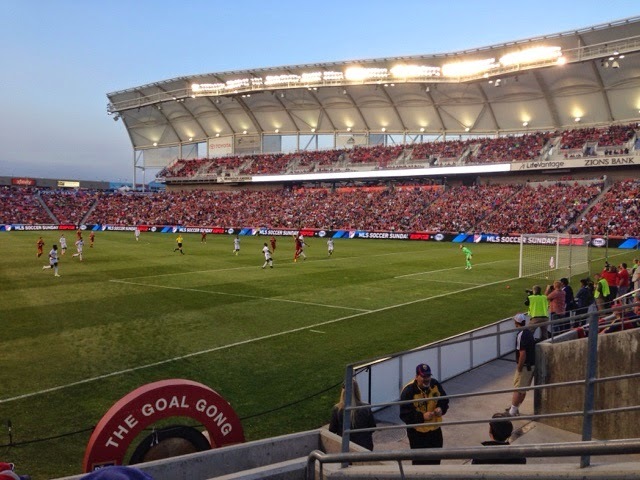 Thanks to tickets from work, we had some sweet Real Salt Lake seats on the fourth row, right next to the Goal Gong. Our life isn't always hockey games and monster truck shows. Sometimes we get a little bit of culture. 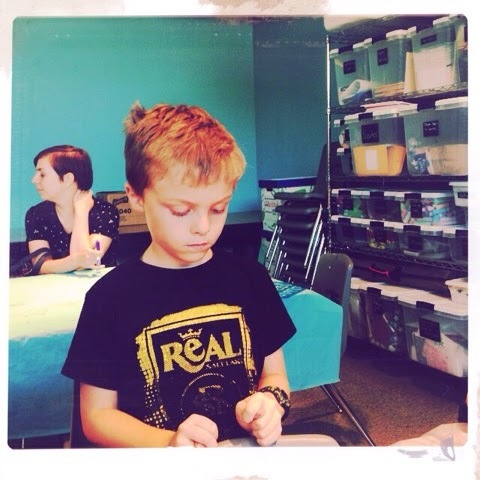 It was Families Free Saturday, so we spent the afternoon at the Utah Museum of Fine Arts. The staff always tries to make the exhibit interactive and fun, but some collections are better suited to kids than others. Latino protest art is a toughy. The boys had a great time at the baseball game. Island in the Sun just came up on the shuffle. Paige said,"I don't really care for Weezer anymore." My heart is breaking. Happy birthday to our favorite four-year-old! What do you call the tennis version of Friday Night Lights...on Saturday? Go figure: About a gazillion other people thought St. George would make a great Spring Break destination, too. A bit crowded, but these monkeys don't seem to mind. Dear Spring Break, I hope you're ready for the Sutherlands.